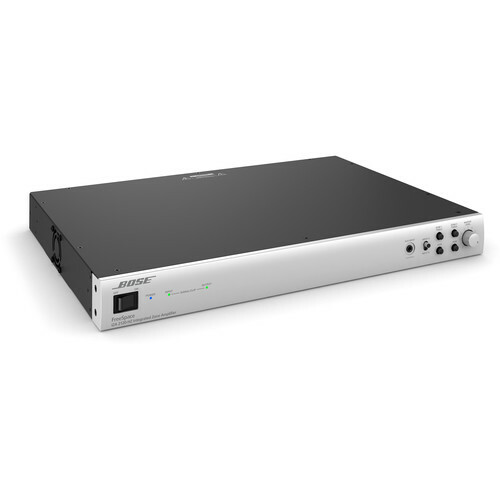 The FreeSpace IZA 2120-HZ from Bose Professional is an integrated zone amplifier for background/foreground music and paging, well suited for business music applications including conference spaces, retail stores, hotels, lobbies, bars, and restaurants. The amplifier is optimized for commercial applications and features selectable Loudspeaker EQ to enrich audio quality, Opti-voice paging for clear speech intelligibility while providing seamless transitions, and Dynamic EQ that ensures full and balanced music at any volume level. The unit offer true two-zone capabilities with two independent outputs, which support optional volume/source selection remotes, EQ, tone controls, and paging/auxiliary routing options. The Opti-Voice paging system equalizes the vocal frequency range for clear speech intelligibility, while providing seamless transitions between music and voice. The independent loudspeaker EQ provides enriched audio quality and ease of use when using Bose loudspeakers. The FreeSpace IZA 2120-HZ ships with several Euroblock connectors and a standard IEC power cord.